You never know what you might find if you just open your eyes, take your dog for a walk, and keep that stupid phone in your pocket. 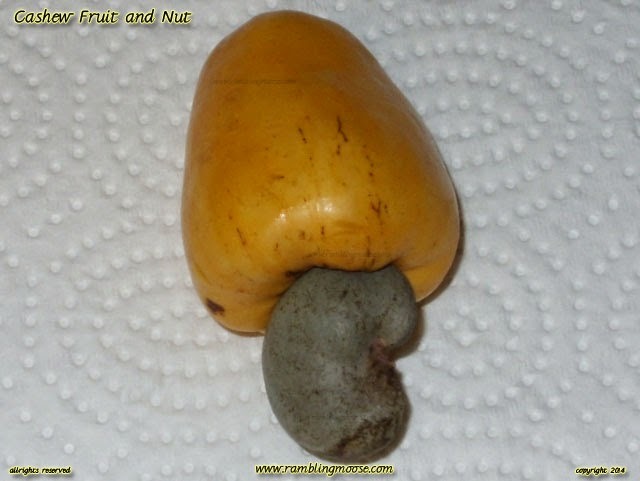 I had been reading about an effort to put the fruit of a cashew tree to use. The trees grow in India in some rather impoverished areas, and anything that would actually help the people in that sort of situation is sorely needed. The Clinton Foundation had partnered with some of the farmers there, and with Pepsi Co., will be trying to use the fruit to make a beverage. Usually the fruit is thrown away to get the Cashew Nut that we've all had. It is high in anti-oxidants, and has a taste that was described like a Mango. Feeling that that was not going to be something I ever expected to experience, I went on with my day. It had come time to take Mr Dog for his second of three walks around town, and I was out on my own for this one. We've got some strange plants growing here. Wilton Manors is not an old city by my standards coming from Philadelphia, but it has been here long enough to have the original homes settled and the trees planted are mature. People would plant things for their enjoyment, for shade, and food. There are many fruit trees here, and they always catch my eye. The neighborhood I grew up didn't have any fruit trees along the sidewalk, although the pin oak trees that were planted when the houses were built are now quite tall and create a lot of shade. The acorns there only feed the squirrels. Having food grown by the road is a bit of an odd thing. Food grows in a supermarket, not in a yard in suburbia. So finding something that is edible and that you never saw before was a shock. Having just read about this the day before it was also on the top of my mind. I saw the small yellow orange fruit hanging from the tree and remembered it. When I got home, I said to Kevin that we have some real exotic trees in this town. A neighbor has a Cashew Tree, and it's gone to fruit! There were dozens of fruit there that were on that tree, I explained, and just thought it was another quirk in this quirky little island and filed it away with the rest of the detritus of suburban life. The next day we both walked past that house and commented to the owner about the tree. They knew about it and told the story that the construction workers that were building the "Bunker House" next door were from The Islands. They came by and asked for the fruit, if it wasn't going to be eaten. The owner gave permission since they didn't really want to try the stuff, and in short order the tree was swarmed over and cleared of fruit. There were a few nuts left on the tree, but the fruit was gone. Apparently they have a lot of Cashew trees in Trinidad and the fruit is a delicacy there. He offered us the one lone fruit that got missed and we happily took it as a curiosity. I got it home and took the picture, laughing to myself saying that I had to look up how to eat the stuff, who knows what strange preparation you need to do to it. The nut portion hangs under the fruit and has a coating inside the shell that is poisonous. That is why all the Cashews you find in a store are in a jar and are pre-roasted for your pleasure. This black sap that coats the actual nut is not edible. But the fruit was edible. Actually, the juice was and I did try it. It tasted like a Carambola Fruit, a Star Fruit. The juice from this little fruit coated the inside of my mouth and an hour later I was still tasting it. It was not very sweet, but an interesting taste all the same. Then again, I like tropical fruit. After sucking the husk dry of that fruit, I took the nut out to the yard and stuck it in a pot on my irrigation chain. It may grow, and if it does, it will go into the ground. Those trees don't get that tall here, and are a good shade tree. The Cashew is a true tropical tree, and since the freeze line is in Boca Raton on Clint Moore road, we're not going to freeze. Yes, I'm 10 miles south of the freeze line. No snowballs here. I did manage to find a video of someone in a Cashew plantation eating one fruit right off the tree. So we were a bit over the top in how we handled it. The fruit has a strong almost acrid scent to it, and I would have to wonder whatever possessed the first person to decide that this strong smelling thing would be something to eat. On the other hand, knowing what it was, I would have it again. It was "interesting" in a way unlike anything else I have ever tried..